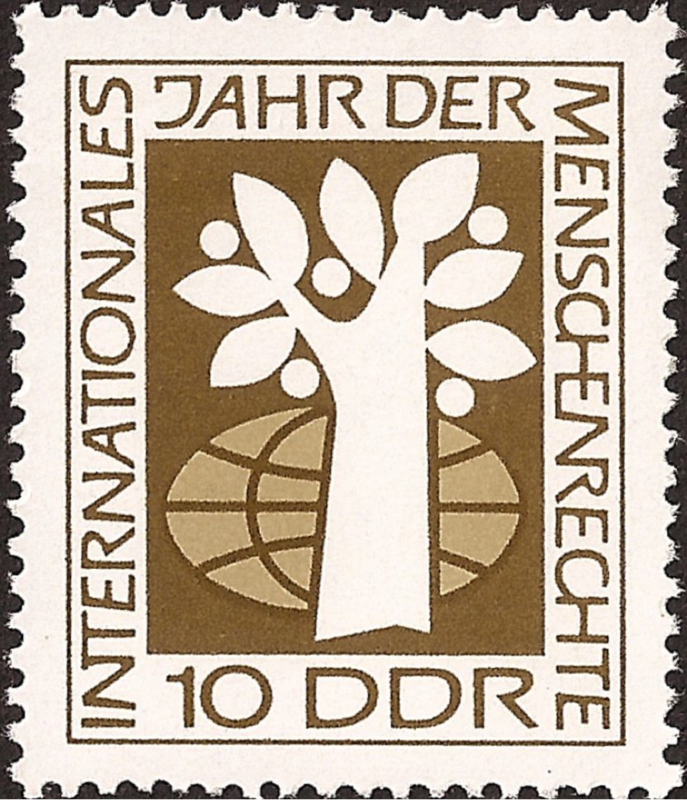 Stamp commemorating International Human Rights Year 1968. The tree and globe represent the right to life. A review of Between dictatorship and dissent: Ideology, legitimacy, and human rights in East Germany, 1945-1990, by Ned Richardson-Little. Ned Richardson-Little’s well-argued and well-researched dissertation challenges the idea that human rights gained importance in the German Democratic Republic (GDR) only after the signing of the Helsinki accords in 1975 – in other words, that the language of human rights was a gift from the West. The problem with this narrative is that it cannot explain why the Socialist Unity Party (SED) signed a document that was so obviously contrary to its own interests. Richardson-Little’s dissertation traces the evolution of the SED’s human rights policies through several stages between 1945 and the 1980s and shows how human rights rhetoric became mobilized by East German citizens as early as 1968. Rather than presenting a narrative of liberal triumphalism from Helsinki to 1989, he demonstrates that human rights discourses existed in the GDR before the 1970s while insisting that these discourses were unstable and contested. The dissertation proceeds in two steps. First, chapters 1-3 trace the evolution of SED rhetoric and policies related to human rights. Chapter 1 traces the adoption of human rights rhetoric by the SED back to the aftermath of the 1946 city-wide elections in Berlin, which the party lost unambiguously. The SPD campaign slogan “No Socialism without Human Rights” forced the language of human rights onto the SED’s agenda. Richardson-Little shows how the SED was threatened by the deployment of human rights language in anti-communist propaganda in the West and deployed the same language against West Germany. In practice, the SED remained bound to a nineteenth-century conception of rights as self-imposed limitations of state power. Symbolic competition over the meaning of human rights, in the period from the mid-1940s to the late 1950s helped solidify the SED’s power. In 1959, the SED sets up the GDR-Committee for Human Rights to coordinate protest campaigns against the ban of the KPD and the incarceration of communists in the Federal Republic. The state-directed committee linked anti-communism in West Germany to the continuing presence of former Nazis in the judiciary. Rather than developing a theory of socialist human rights, the Committee engaged in a process of translating human rights into the East German idiom of antifascism. Consequently, the state managed to monopolize the translation of international human rights into a local idiom. If in many cases this translation allowed for challenges to the state, in the GDR it served to further consolidate the SED’s power. Chapter 3 begins with the formulation of a positive conception of socialist human rights grounded in the emphasis on self-determination by legal theorist Hermann Klenner. Building on work by Julian Go, Samuel Moyn, and Andreas Eckert stressing the importance of anti-colonial nationalism for the human rights discourses of the 1960s, Richardson-Little argues that emphases on sovereignty and national self-determination in human rights discourses at the time meant that the SED – heading a regime that had not yet gained widespread international recognition – had much to gain from an embrace of human rights. Put into this context, the signing of the Helsinki accords in 1975 by countries in East and West is rendered far more plausible than in the narratives of scholars who emphasize human rights as an import from the West. Richardson-Little rejects the suggestion that by the 1960s, human rights propaganda is mere cynicism: “Rather than provoking self-criticism or reform, the two decades of propaganda equating socialism with human rights intertwined with the new ideological work of Klenner and others to facilitate a mass rationalization of the East German political and economic system by state officials in the language of human rights” (p. 153). The language of human rights did not appear as a threat to the SED’s power, and in fact, up to the late 1970s functioned to sustain it. This chapter concludes the argument that the SED developed their own conception of human rights before the Helsinki accords in 1975. The second part – composed of chapters 4-7 – shows the use of human rights language by East German citizens beginning with the state’s campaign leading up to the referendum on the 1968 constitution and ending with the collapse of the regime in 1989. Chapter 4 complements the argument in chapter 3, by showing that human rights language was available not only to the state but to citizens, and that they made use of that language in attempts to force concessions from the state. In thousands of letters citizens – often organized by churches – mobilized the language of human rights to lend force to their arguments about religious freedom and freedom of movement. The chapter builds on scholarship complicating the dichotomy of loyalty and resistance and argues that East German citizens using human rights language did not do so to delegitimize, but to shape the regime. Even though citizens mobilized the language of human rights ahead of the referendum in 1968, the GDR did not spawn its own dissident human rights movement. Chapter 5 shows that while – if all else had failed – those trying to leave the GDR sometimes resorted to human rights language, the anti-communism in Western human rights discourses made human rights-based dissent an unattractive option to many who had become disillusioned with SED rule, but nevertheless sought socialism. Consequently, churches endorsed the SED’s claim that the GDR conformed to human rights while continuing to try and force concessions from the regime. Until the 1980s, the SED successfully tied the language of human rights to the legitimacy of the socialist state. But in the 1980s, the SED’s strong hold on these discourses collapsed. The revelation of torture and mistreatment by post-colonial regimes had shifted the international human rights discourses towards individual rights. The SED’s repression of the peace movement moved peace activists to increasingly mobilize for reform under the banner of human rights. At the same time, a coordinated effort to establish a Socialist Declaration of Human Rights began in the early 1980s and collapsed in 1988. In the final chapter, Richardson-Little argues that dissident intellectuals sought to reform the East German state until the end. Human rights was not only a question of gaining political rights but also a question of promoting a future that continued to work towards socialism. But economic crisis slashed these hopes as more and more East Germans rejected the GDR’s legitimacy and opted for unification with Germany. Richardson-Little makes a compelling argument for recognizing that human rights in the GDR were not an import from the West but developed within the GDR in complicated processes of translation and internalization in the context of anti-colonialism and symbolic competition between East and West. His dissertation builds upon and expands work on human rights that no longer assumes a stable meaning of the term and no longer implies that concerns with human rights automatically lead to liberalization. The GDR provides a clear case in which human rights were mobilized for the sake of authoritarian rule and the denial of individual rights. The contemporary significance of this can hardly be overstated. University of North Carolina, Chapel Hill. 2013. 404pp. Primary Advisor: Konrad H. Jarausch.